The next morning I woke up with all the fatigue of travel and aimless wandering wiped away. I slept pretty soundly, which surprised me due to some of the stories I’d heard about capsule hotels being sleazy places. I got up at a decent time in the morning, around 8 o’clock, and decided to wash in their public bath in order to get rid of the smell now radiating from my armpits. Bathing in Japan is a completely different experience, since most of the time you’re hard pressed to find a standing shower-head. In the long run, I feel like it’s a much better way to clean yourself: you still have a shower nozzle, but you’re sitting down so you can actually scrub the hard to get places. Maybe it’s from my time on the cross country team or just because I’ve been to Japan, that I don’t feel embarrassed to do this kind of bathing, but it’s always referred to as a more scandalous cultural difference. Instead I think it’s a strong point for Japan not to teach people to shame their bodies or automatically give nakedness an implicit sexual connotation. If you ever got to see my senior art show, it’s something I tried to analyze with that. So freshly shaved and somewhat less smelly, I departed the capsule hotel that morning–this time passing two men smoking in the stairway–only to realize that I was still in Shinjuku. It was a bit strange, to in a place so associated with nightlife and tourism yet with none of that going on. As I made my way to the station I passed by a series of people doing as we usually call it ‘the walk of shame‘. It was pretty amusing and baffling to realize the type of work that goes in those places. There used to be a good documentary on Netflix that gives an enlightening overview. In a city with 13 million people it takes all types of nightlife. A couple year back when I first studied abroad I had a couple weekends to experience the process. Subways in Tokyo stop pretty early, sometime around midnight, so if you want to go out you’ve only got limited options. Especially since most places don’t really start the night until 10 o’clock and taxis typically costs what Uber only dreams about charging, the only economical option is to stay out all night (until the subways start running around around 6 or 7). Originally I was planning on saving this type of night for Monday (having the whole train back home to recover), but seeing the aftermath I was starting to doubt its appeal. As I almost got to the main street down Shinkjuku a couple, a girl and guy, walked towards me on the same side of the street: giggling, stumbling, and in their own world. I didn’t have much to do but pass by, until the girl by some mystical magnetic force connected her forehead right into my shoulder. The guy started laughing, and the girl without making a sound just slumped to the ground. I asked if she was alright, ready to assist in getting her back to her feet, but she just slowly rolled over and continued giggling. As I walked away, cars now trying to pass the narrow street, and her refusing the man’s attempts to get her to stand up, I had to make the connection that it’s the foreigners that are always told not to get drunk and cause problems in the city. 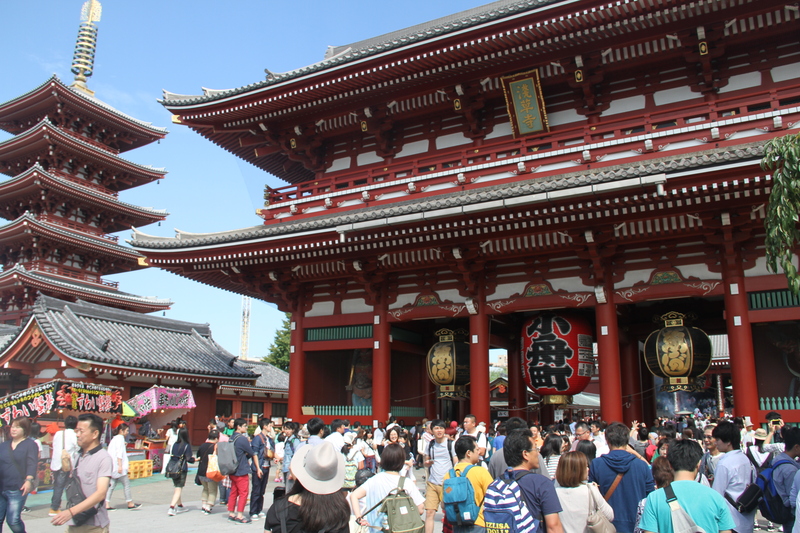 As I mentioned, when I went to sleep last night I knew I needed to start this day with a plan and so I made my way to one of the bigger sightseeing places in Tokyo, Sensou-ji often called Asakusa Temple, where I also hoped to snag a great breakfast. 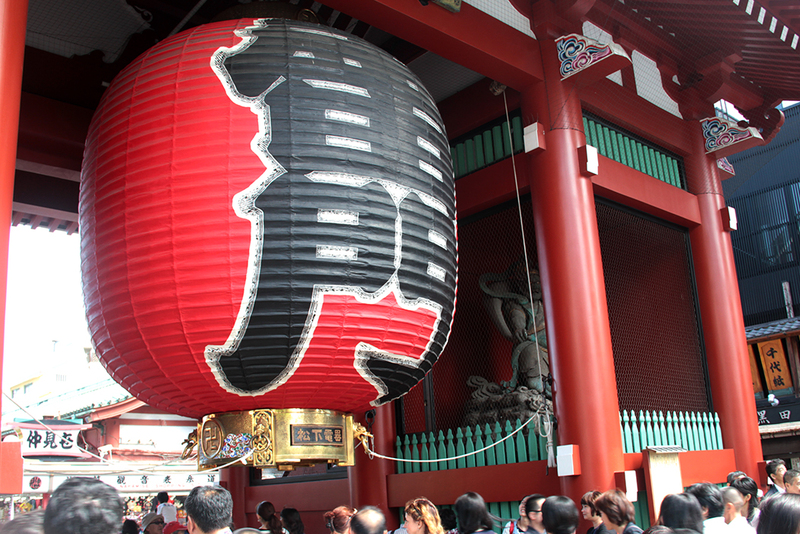 It is a very bustling place, but nonetheless enjoyable. Basically, you start by entering the front gate, and walk all the way down past a slew of tiny shops selling sovenir, food, and traditional artifacts. 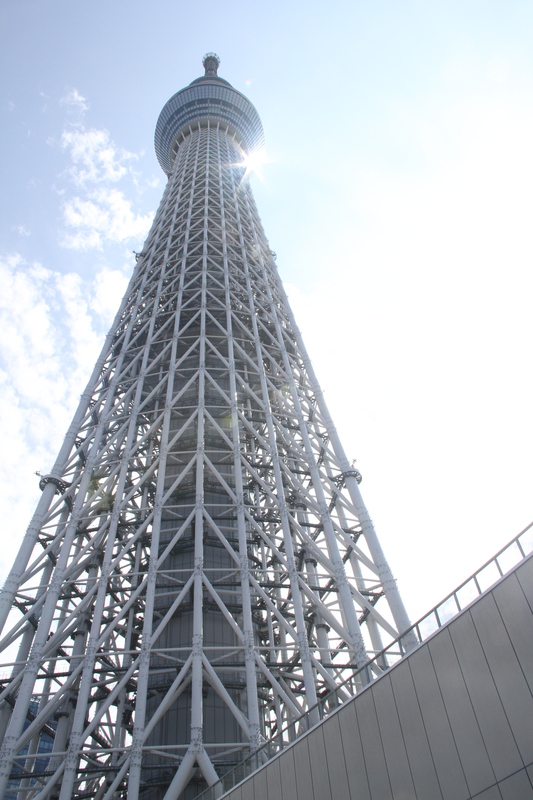 It is truly one of the free places in Japan who’s sole purpose is sightseeing. I ended up getting green tea mochi on a stick, while walking to the end. There were a number of food stalls at the back gate that didn’t exist the last time I visited and if I wasn’t so mean with my money I probably would’ve ordered something from each. 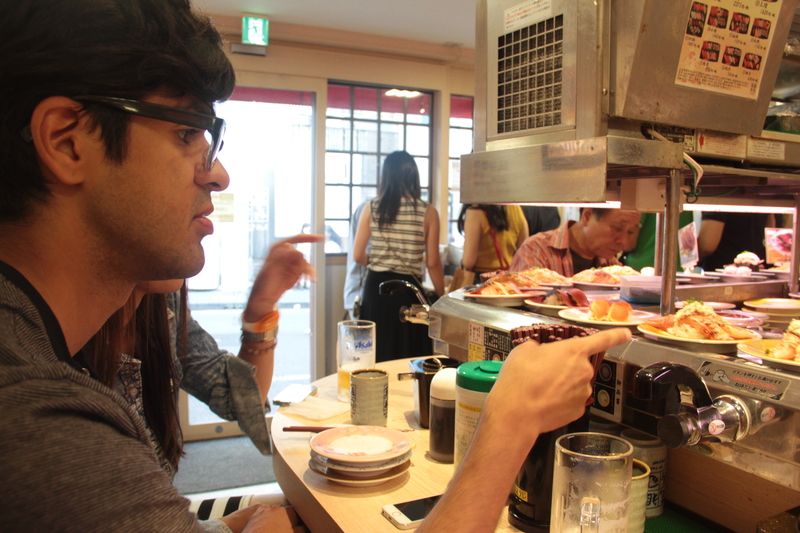 There was yakitori, karaage, crab, dumplings, all too much for my nose to handle. In the end I settled on yakisoba, one of the best I’ve tasted yet, and ate it sitting down in the nearby shade. Already a great start and perfect contrast to yesterday. It was kind of luck that I started off there, because the second stop on my trip, Tokyo Sky Tree, was actually in the same part of Tokyo, almost visible beyond the building’s horizon at the temple’s court. I took a short shuttle there and followed in a small mob of people the way out of the station, around the aquarium at its base, and up the stairs to the entrance of the tower. Of course, my natural American instincts went to work in coming up with a reason not to talk to her. So far my only experiences with someone in Japan asking if I have a moment has resulted in filling out a survey about my electronics shopping and politely declining to listen to Jehovah’s Witnesses. Alas, it’s not like I had much else to do, anyway hadn’t I been complaining about not talking to enough Japanese people? We ended up having a pretty cool conversation. She was a high school student doing a project for her English class to talk to foreigners. It was kind of nostalgic, because I had been in that same situation when I studied here in college, but I was also flabergasted by her fluency in English. She said she is planning to go to America (*California, like everyone else I’ve met) next year, and was pretty happy to hear that I was an ALT. It offered a cool insight to the types of lives my students–with their identical uniforms and hairstyles–might eventually lead in their future. In the end she took a picture with me (for proof), and I felt like even on vacation I was able to do a little work. Now I think this is dubbed the tallest tower in the world, and all my students have remarked in their essay’s about its beautiful view, so I felt compelled to check it out for myself, and maybe it’s coming from New York, but when I got to the base it didn’t seem all that astonishing. I went inside where there was a decent queue and no definite direction on where I’d actually go to get a ticket to the top. They had this counter where people were lined up that was labelled in english; rapid line, but that had the type of connotation that you’d be paying a little extra. In the end I couldn’t find a ticket counter, but I did see a sign that had prices on it. The wait was half an hour and the price was ￥3000, otherwise a bit above my budget for the “beautiful view” that consists mostly of concrete slabs, an ocean if you’re lucky, and a glimpse of Mt. Fuji you’re divine. I knew of a place in Shinjuku that allowed you to visit the observation deck for free (somewhere I’d gone on my first study abroad trip here) and decided that that would be enough of the view for enough of the trip. I did peruse across the gift store, mostly just fuji-tv themed key chains and omiyage. I did pick up a pretty sweet Attack on Titan sticker, and a Sky Tree themed Evangelion folder for less than ￥500 so at least I’ve got something to take back with me. It was still before noon by the time I got back on the subway, so I decided to spend a little more time alone before meeting up with the people I was going to the concert with. By now I had looked up some things going on in Tokyo and had come up with a couple of options. Strangely, plenty of places around Shinjuku and Shibuya were celebrating Octoberfest, and there was a huge beirgarten I had been interested in checking out. 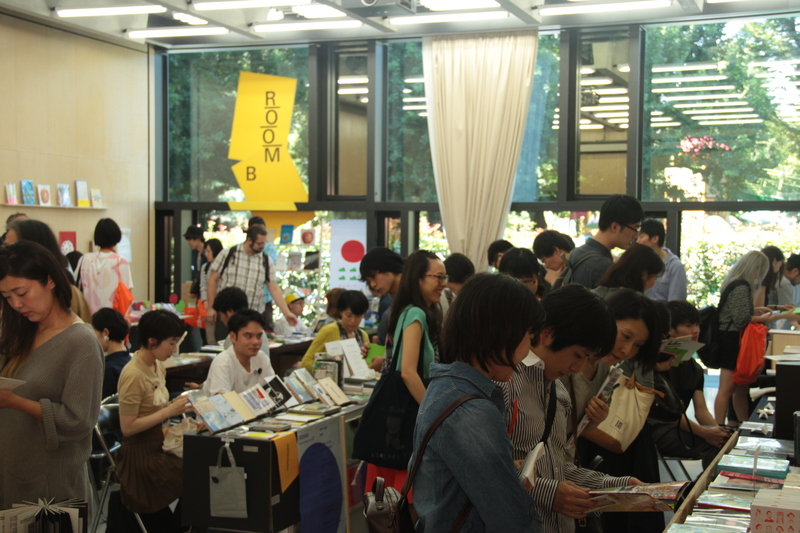 Alas, it also happened to be the weekend of the Tokyo Art Book Fair at the Tohoku University of Art and Design, and I had been Jones-ing for any aspect of art in my life for a while. It was perhaps the best decision I’d made all weekend. It really does seem so long since I’ve been involved in anything artistic. I’ve tried (poorly) to do whatever work I can in my free time, but these whole past couples of months were all full of saying goodbyes, packing, moving out, moving home, moving in, trying to study Japanese, and avoid leg injuries at all costs. Now that I’m in Japan I’ve been only vaguely looking for the materials I need to start printmaking again, and trying not to resign myself to the loss of living in the rural and not being able to figure out where to start to look. It honestly isn’t that hard and apart from start-up costs it’s just one more thing I’m waiting to start when I’m finally settled. Anyway, back at the fair. At the entrance there were a bunch of stalls selling all assortment of foods that you’d likely find at a twenty-something’s street market in the Pacific Northwest. They had honeyed sweets on a stick, homemade tamales, crafty obento, even organic wine, and already I felt at home. Maybe (and it’s probably the case) it’s because I was completely surrounded by like minded people in the first time in a long time. Even with a grumbling stomach I skipped past the stalls and headed straight for the open rooms lining the inner courtyard. I think I was just eager to see real actual physical handmade art, too, because I didn’t really try to absorb anything that I was seeing. I just sort of wondered around. By the end I was feeling so optimistic. I’d bought three prints (actual hand made screenprints) to take home with me and finally get up on my bare walls. I met a crew that worked out of printshop and design company that I will definitely visit if I ever get to Singapore. I also talked with two fantastic artists, one who I bought a print from, who were former JETs. It was so reassuring, like looking at some potential version of my future. Both were Australian, one who went to school at Tohoku and another who traveled back and forth doing various art pieces. They both seemed to have had eccentric lives, but like me, spent their time on JET in the inaka. After talking with them the interesting thing that stood out was their pieces of most important advice were the same: they both said to learn as much of the language as I can. I wound up getting some of that organic wine because hey, treat yourself. I left with a goodie bag and a bounce in my step and messaged Carmelo to find out where in the Tokyo he wanted to meet up. I wound up at Harajuku, which on a normal day is packed but I suppose on a Sunday holiday is egregious. Understand that I’m slightly exaggerating when I say it took me forever to get from the subway platform to the front of the station, packed in like fish in a net, but really even Shibuya crossing didn’t have that many people. The day turned out to have a good amount of sun and it’s lucky that we’re both over six feet and people of color, because otherwise I don’t think I could have found him. Even when we were both standing at our chosen meeting point it took a couple minutes of looking around. We basically chose Harajuku as a meeting point and then it was back into the fishing net to troll along to the platform. Harajuku is a pretty good place to visit (also for the previously mentioned shrine), but unless you have fat stacks in your wallet and are generally a woman in your early twenties, it’s basically only good for getting crepes. Instead we found our way going to Shibuya to kill some time. I should mention that we could’ve gone to the concert grounds by now. The stage opened at 10:00 and I did pay for the entire day. But really, I was kind of still worn out or at least not ready to get into a party scene. So Shibuya, known for its mass people crossing and its Starbucks was the place to chill. Carmelo, his girlfriend and I decided that it was food we needed most. By now it was hitting well after 2 o’clock and I hadn’t eaten anything since my morning break at Asakusa. Heading down what looked like the main street we sort of kept revolving trying to splice out which places were for food, and of those places which one we wanted to eat at. I can’t say I was craving anything in particular, but the thing that stood out in my mind was sushi. I think because another guy we were meeting up with at the concert said he was going to Tsukiji for the dawn fish auction and I was half tempted to wake up that early just to eat absurdly priced cuts of fish that were less than three hours out of the ocean. After a bit of waffling we went into a kaitenzushi place that seemed like it wouldn’t break our budgets. If you’ve never heard of kaiten it’s basically a conveyor belt buffet, which seems like it would actually have been something created in America (if not maybe for some FDA regulations). You pay by plate, each color coded by price, so it’s both easy and dangerous to keep track of what you’re eating. For example, I got one small plate of salmon that was ￥200, and decided to get another, and I also got a delicious ￥300 plate of something, and a couple ￥100 plate dishes (cuz hey, they were only 100), add on ￥500 for a beer, and you’re easily hitting a $15 meal. Although being that I was on holiday with literally the most amount of cash from a paycheck I’ve ever had, I tried not to pay too much attention to it. With full stomachs we departed from Carmelo’s girlfriend at the station and made our way to Odaiba, a man made island the likes of lower Manhattan now featured highly in tourist type attractions, where the concert was located. It tooks us longer by maybe an hour than expected, both at fault for taking multiple wrong turns. We rushed to find a locker to store our stuff and finally got on the right subway line. At this point I have to plug in how efficient a Suica card can be for a lot of travel around Tokyo even if you’re only there for a weekend, so if you plan on traveling there definitely invest. Once we got there we found our way to Anton, the final link in this bro trip. 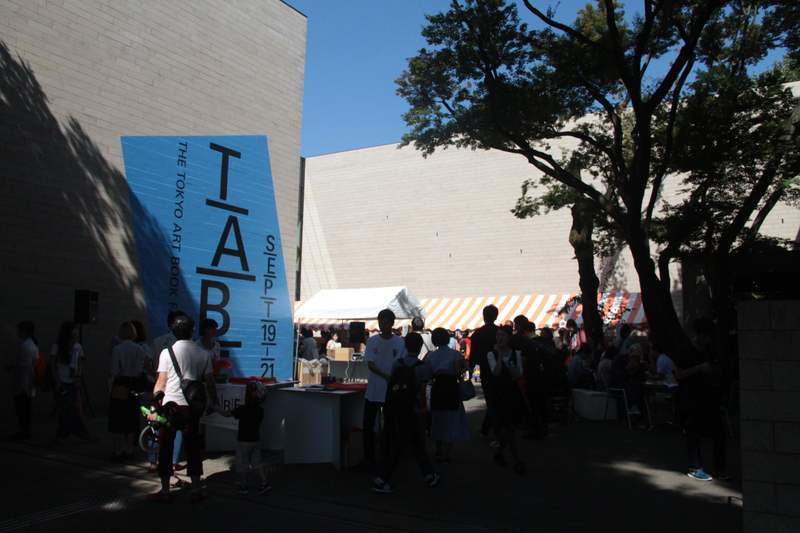 Many places around Tokyo are pretty easy to make arrangements to meet people. There is usually one odd landmark that sticks out among the crowd. 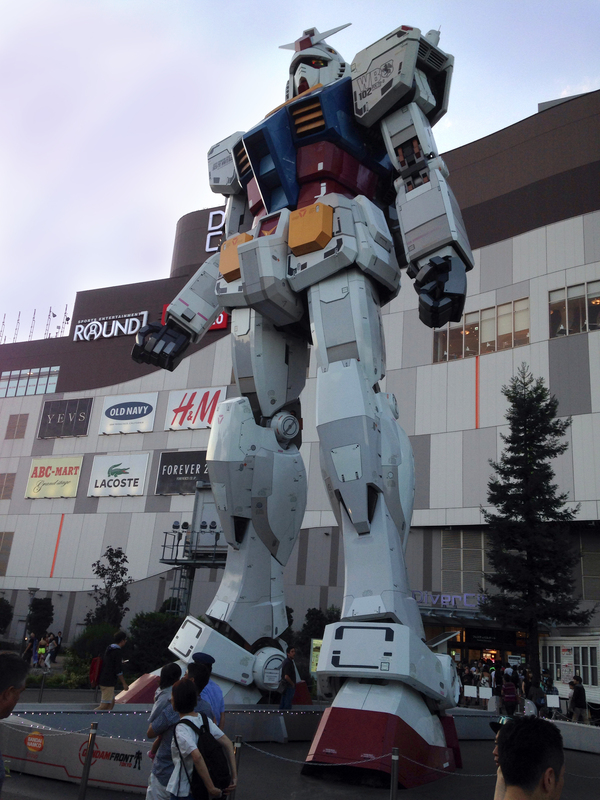 I think in that category Odaiba takes the cake, though, for it’s ‘life sized’ Gundam fighter. Now, I’m not certain what kind of reference an anime series like Gundam can use to call something life size, but either way it is a pretty sweet feature. We actually hung out around the base for a little while chatting, and I think unconsciously it was just because it’s so cool to stand by that thing. We went into the mall behind it for a brief drink pit stop, and needless to say it was packed. Now it was curbing six o’clock and I remained doomed to be impressed with how many people were out. Not since leaving New York had I ever seen as many people as I have this weekend. It was quite overwhelming. Yeah, but that was also before we got into the concert grounds. We started off in the back and after realizing how crowded it actually was made some quick decisions. Now, I’ve been frequenting concerts ever since an emo phase back in junior high when I went to a warehouse in downtown Minneapolis to see a show of somewhat obscure rock groups including Houston Calls, As Tall As Lions, and June. And during that time I learned the first lesson that everyone needs when going to a concert and that’s how to stake out your ground. Most recently I’ve been frequenting the local shows: mainly Rock the Garden, and the hits that comes to First Ave. So (as all Minnesotans are passive aggressively polite) it hasn’t been since Soundset my freshman college summer, since I’ve needed to deal with the subtleties of a mosh pit. I looked to the guys and made sure to tell them, “If we do this, I’m going in and not looking back, so make sure to stick with me.” At some point I’m sure I quoted Pirate’s of the Caribbean. It’s a good thing too, because by the point we stopped moving we ended up without Anton and it was just Carmelo and I and a surprising amount of foreigners. I ended up next to a woman from Washington D.C. and a guy from Ireland, and that was before the crowd started moving in. 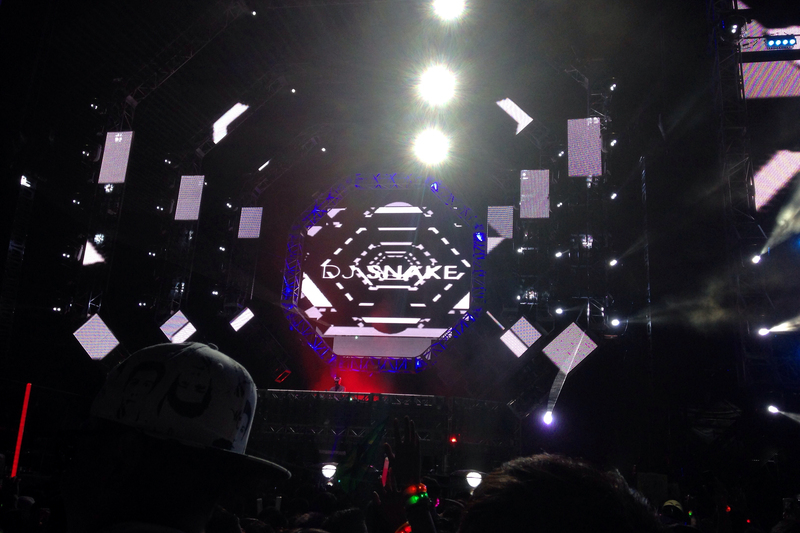 We landed there during the mid-beginnings during the second to last set, DJ Snake. Now I can only describe him as potentially the club version of Pitbull. His music is really catchy, he’s decent on featured songs, but for some unknown reason you just tend not to like him. He did in fact determine the entire pop scene last year with his number one hit song, both blessing and curse, so at least I get to say I saw him live. Then onto the final headliner, after an awkward break while they changed equipment, and Carmelo and I pushed even further to the front. Not that we weren’t satisfied, and I actually worried about going too far ahead to get out of the ambiance of it all. 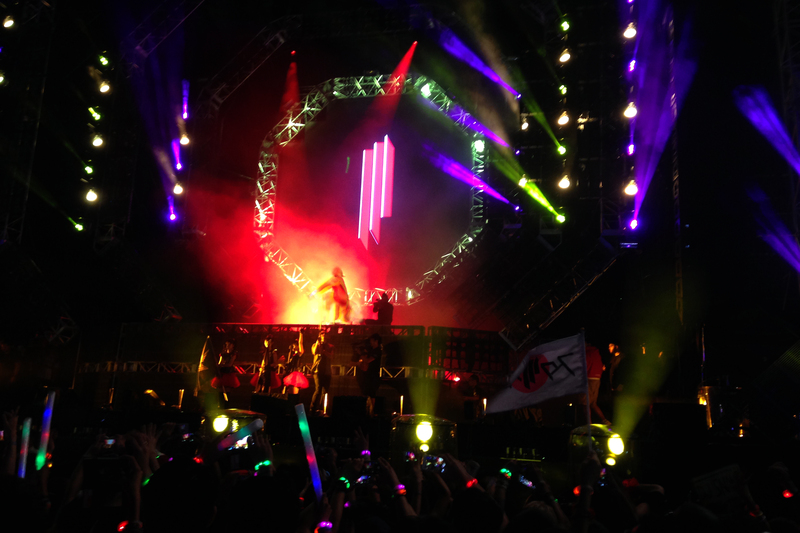 Then he, Skrillex, in all his long haired ray-ban glory, finally took the stage and started. The crowd of course went wild, myself included, and it wasn’t long before I worked up a necessary sweat. Soon into the set I was hitting a natural high. I didn’t really drink too much, just enough to get a buzz going, and I really just felt like I was melting into the atomosphere with the amount of the music. It’s a bit funny the first huge EDM festival I go to didn’t involve a single whiff of marijuana or encounter with the guy who’s tripping way too hard. The drug laws in Japan really keep away a lot of problems. Not to say that all you can drink buffet hours are a good thing, but the amount of zero tolerance on substances (even for driving after any drink) is admirable. Back to ear melting, eye blinding, body shaking rave parties. I wasn’t keeping track of time, but every time I thought the set was calming down and about to finish it would restart and get going again. 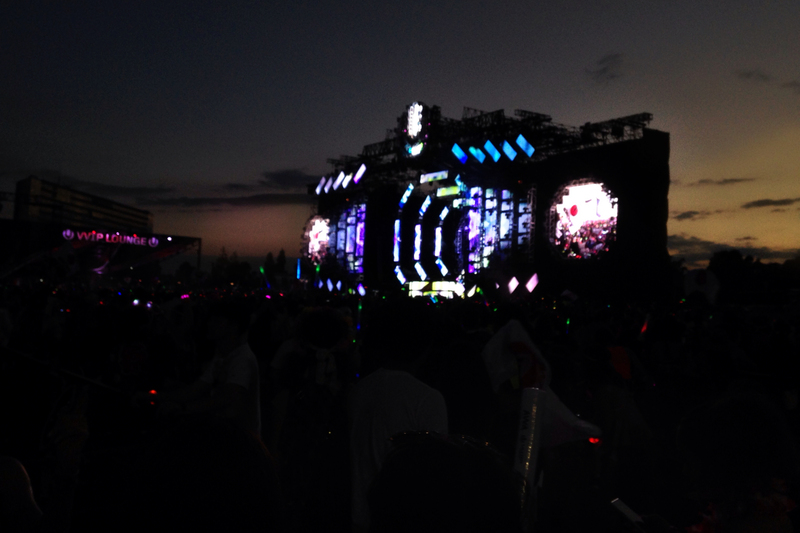 It’s funny to hear an American DJ speak English at a Japanese crowd. It’s like, every time he says “Put your hands up” or “Get low” you really have to wonder how many people can actually understand. 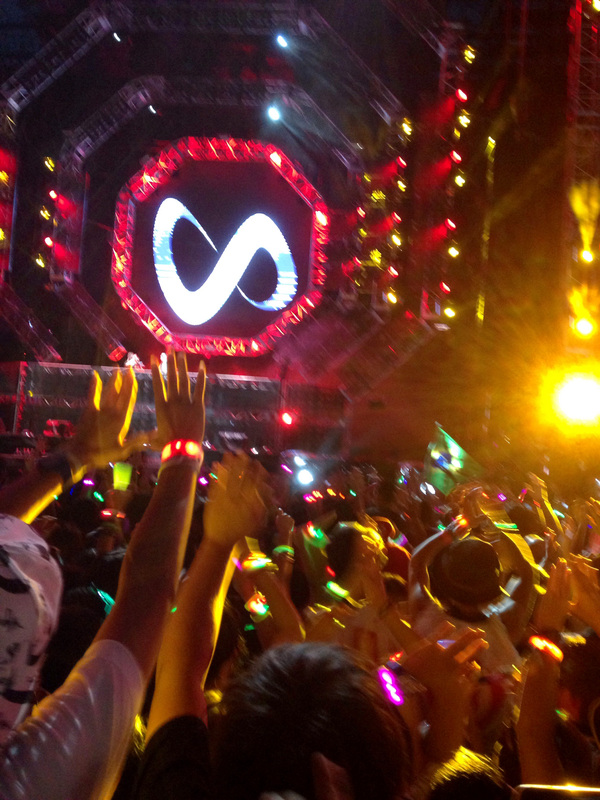 Luckily, I was one of them, and there’s no form of submission better than giving full control to a world renowned DJ. I’m pretty sure, though, overall the whole scene was a little dampened. I’m not quite sure if maybe it was because it was outside, because it was the audience, or the venue, but I’m certain the bass could’ve been just a little louder, the sound just a bit more booming. I suppose it just saves my hearing a couple years down the line. Between the shouting of the people and the air tossing of my head it’s a wonder I heard anything at all. There was a point where I realized I hadn’t drank enough alcohol to give excuse to my actions and I was in full control of my body. I wonder what it would’ve looked like if I was the only one at the concert but still moving as radically. You can check out the full setlist and somewhere on the interwebs you can download most of the sets. It ended with multiple flames, fireworks, an all girl Japanese ‘heavy metal’ band, and some flag waving. Strangely content I feel like I came down from the vibe at just the right time. I had hardly a buzz, little sweat, and my voice still had volume. Another feat of Japan efficiency was how long it took us to get out. It did seem like a long time, but there was such an organization to it I felt like herded cattle, and it definitely halted any bottleneck effect. Outside on the mounds surrounding the Gundam under little lanterns in the trees, multiple groups sat to continue the night. We ended up not finding Anton but meeting up with the Brazilian girlfriend of one of our neighbors. After a not so quick stop at McDonalds (oh the pain) we wound up back on the crowded subway. I think it’s pretty common to hear that they pack people into Tokyo subways like sardines in a can, and that might be true on particular weekday mornings during rush hour. I definitely experienced it years ago when I first came, but really had yet to be crushed against anything this time… until now. The unfortunate thing about this man made island is that there are very few ways to get off and on it. Mainly in our situation, it required a train disconnected from other parts of the subway system. Actually on the way to Odaiba, after taking our wrong turns, I saw a couple with two young children rush onto the train right as the doors were closing. When they took a breath and looked down they realized they only had one child. Still standing on the track, on the other side of the closed doors was a cutely pathetic six year old Japanese girl, staring indifferently as her parents zoomed away. Granted, they were able to quickly do some gesturing with their hands for the girl to stay there, but the whole scene seemed so cliched there was hardly any anxiety. In fact, it seemed like the parents might’ve encountered this situation before as they got off on the next stop and waited to go back. Always one to make comparisons, I can’t help but think of the drama and severe panic that would ensue on both parties if that situation happened to an American traveling in New York (of course New York is a bit dire, but I think any big city would do). Getting off the subway, we also were rushing through the station to get to the locker to find our bags. At first it didn’t look so good, as the station was pretty winding, and many areas were closing down because of the time. Thankfully my knack for retracing my steps kicked in under pressure. Although, after that we had a bit of a problem figuring out where to go. We were trying to figure out if we wanted to spend all night partying or if we just needed to wind up in a spot we could find a place to stay. Because of the time it would take to get from where we were to where we wanted to go, by the time the trains stopped running we couldn’t do both. We opted for the latter, of calling it a night, and headed to Shinjuku. We ended up walking around to a couple of different capsule hotels, until we came across one with some vacancy in the heart of Shinjuku. We dropped off our stuff and then almost one in the morning headed out to find some food. After all, we didn’t really get dinner. The decision came to Korean or Yakitori, and since the latter is not always reliable depending on the restaurant we went for the food that would be harder to find back in Fukui. It capped the night off perfectly. I ordered bibimbap (shoutout to Stefan) and cruised easily to sleep. The place wasn’t as nice as the capsule I was in last night, but with a day like that anything was fine. Posted in Vacation.Tagged relax, tokyo, travel, vacation.